The Borden Project comprises granted Exploration Licence E70/4912 covering an area of 167 blocks or approximately 475 km² and abuts the Wheatbelt town of Gnowangerup and encompasses the small township of Borden, Western Australia. E70/4912 (Borden Project) showing previous soil sampling and gold results and the Glenisa Prospect (inset). Note: The geology is based on geophysical interpretation and modelling as explained in the Independent Technical Assessment Report within Cygnus’ Prospectus dated 22 November 2017. The Borden Project straddles a northwest-southeast striking, crustal-scale fault zone that forms the boundary between the Boddington Terrane to the west and the Lake Grace Terrane to the east. The principal target at Borden is a greenstone belt interpreted by Cygnus from regional geophysical datasets. Previous exploration was limited to surface sampling which defined the Glenisa Prospect (max 61 ppb Au). 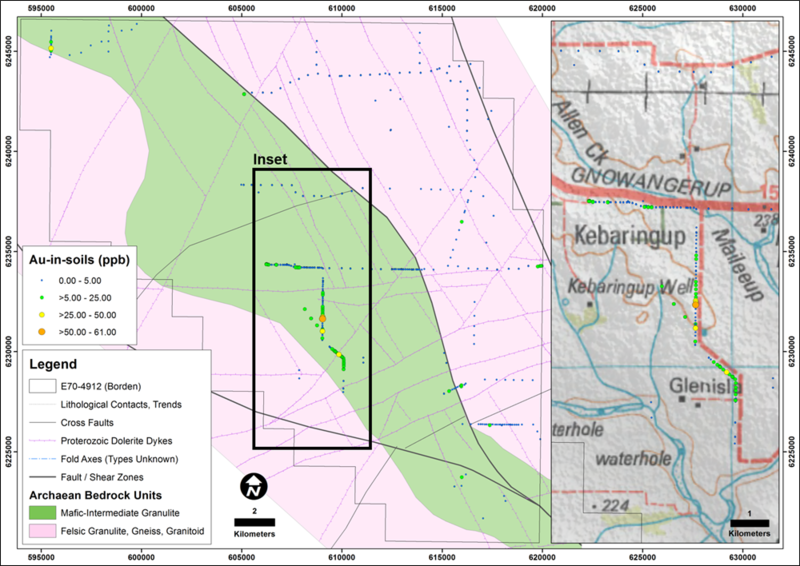 This prospect and the occurrence of the Katanning gold deposit cluster in a similar geological and structural setting ~45 km along strike to the northwest indicates the potential for gold mineralisation within the Borden tenement. There has been no prior drilling on Borden. In May 2018 Cygnus was awarded a co-funded drilling grant from the WA State Goverment to test high priority targets at Borden.